Sweets have always been my weakness, but it is cookie dough in particular that causes me the ultimate grief. During the summers growing up I worked in the kitchen at a summer camp doing dishes. When the cooks had cleared out for the day and it was just me singing along with Tom Petty’s Wildflowers while I sprayed down industrial-sized pots and pans, I’d sneak into the freezer and grab ball after ball of frozen cookie dough. I almost always gravitate towards cookie dough ice cream treats and when I make cookies at home I’m usually full before the cookies come out of the oven because I’ve tasted so much of the dough in the process. I just can’t stop myself. So when I saw on Pinterest an image of a sundae dish full of cookie dough I was already hooked, then I visited the original source, Chocolate Covered Katie and I became obsessed. Her recipe for cookie dough that can be eaten raw was not only appealing for the “spoonfuls of cookie dough” aspect, but because its base is garbanzo beans. Yeah. Garbanzo beans. No flour. No eggs. No butter. And while this recipe is delightfully sweet, it’s sweetened only with dates (and a handful of chocolate chips). I think it tastes just like peanut butter chocolate chip oatmeal cookie dough, which is delightful. I’ve been keeping some in the fridge so when I get a ridiculous craving for a sweet that I just can’t curb I have a spoonful. Maybe it’s the bean base, but one spoonful is all I need to be satiated. And while spoonfuls are delicious, this dough is also pretty great rolled flat, frozen and then cut into chunks as a tasty addition to homemade vanilla ice cream. 1. Warm 1/2 pint of milk with vanilla. Do not boil. 2. While milk warms, in a separate bowl, mix egg yolks with sugar until thick and incorporated. 3. When milk is warmed, but not hot, slowly pour milk into egg and sugar mixture, stirring constantly. After all is mixed together, pour back into pan and heat until thickened. Remember that you are cooking eggs so stir constantly and heat slowly so that you do not scramble. Custard is ready when it coats the back of a spoon. 4. Let custard mix cool. 5. When cooled, mix in the remaining milk and the half and half, then freeze in your ice cream maker. 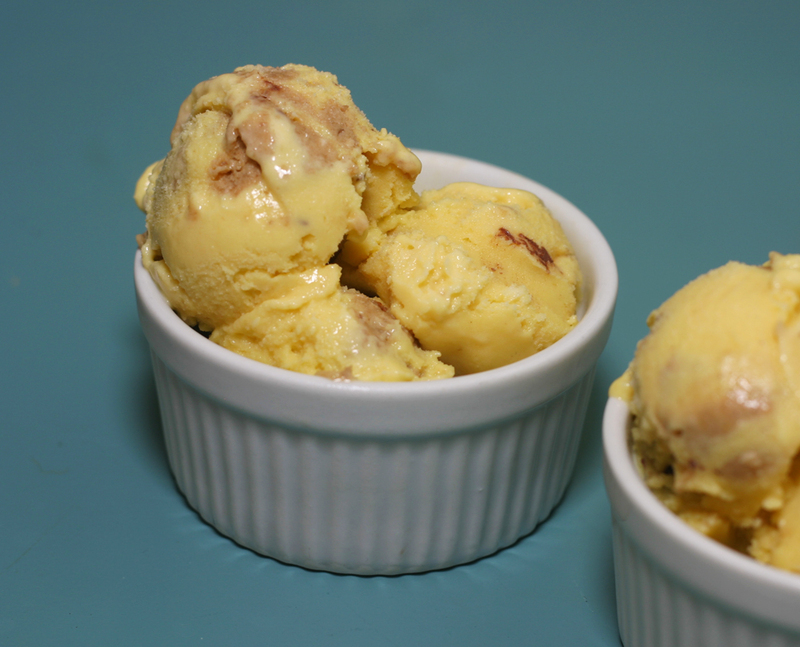 When ice cream begins to thicken, add any treats you might desire. I used 1/4 cup of cookie dough rolled flat, frozen, then cut into chunks. 6. Transfer ice cream to freezer safe container and wait for it to freeze before enjoying. It’s definitely not guiltless, but if you are indulging this is the way to go. Uh yum! Beans into dessert, heck yeah! I just discovered Pinterest too and now have too many sites to visit instead of doing work! PS. Look forward to something bite-sized and cookie-dough-y in your mail box in December! I’m so glad you think this sounds good! I was beginning to think I’d lost everyone’s faith in me and that I’d been written off as a loon. Beans. Dessert. Wha?